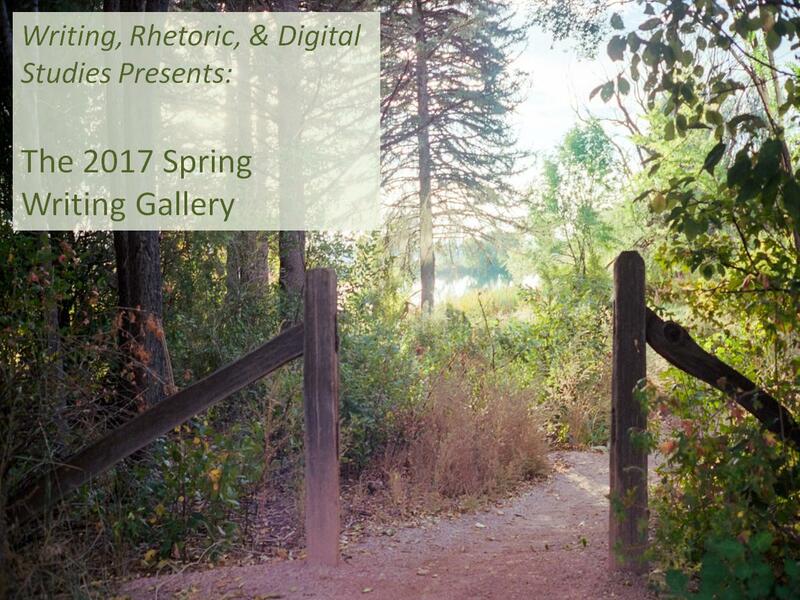 Now in its fifth year, the WRD Spring Gallery is an annual showcase of student writing at the University of Kentucky. This installation features composition projects created in first-year writing courses offered by the Department of Writing, Rhetoric, and Digital Studies (WRD) during the past calendar year. These projects include multimedia documentaries, photoessays, podcasts, websites, and other types of writing that students often create in their WRD classes. By sharing student work in public, we are not simply “showing off” our students (though we like doing that). We’re also fulfilling the University of Kentucky’s mission as a public, land grant institution by showcasing our students' engagment with issues and ideas affecting our lives here in the Commonwealth. We’re confident that WRD students will leave UK with a better set of writing skills that will serve them well throughout their careers. But perhaps more importantly, they will also leave with an understanding that writing is an indespensible tool for exploring the world around us--a world that often only comes into focus through the written word. MANY WRD STUDENTS CREATE MULTI-MEDIA DOCUMENTARIES AS PART OF THEIR WORK IN WRD CLASSES. THE FOLLOWING IS A SELECTION OF WORK FROM 2016 FIRST-YEAR COURSES. Rebecca C. Hayes "Benefits of Youth Agricultural Programs"
Sydney Hendrix, Archana Jeeji, Carson Mullins, and Kristen North "Feminist Alliance"
Brennan Poole, Molly Dalton, Christian Carpenter "The Most Disrespected Person at UK"
Emily Burgess, Emma Guckiean, Claudia Kadon, Hannah Phillips, Sydney Sanford, Sarah Sbert "Something to Come Together"
Gabby Marmolejo "¿Donde Estan los Latinos?" Noah Arragaw "The Hub PSA"
Maxine White, Sabrina Hardy, Alice Kiser, Sydney Epley "The Change Starts with Us"
MANY WRD STUDENTS ALSO CREATE WEBSITES AS PART OF THEIR RESEARCH IN WRD COURSES. THE WEBSITES BELOW ARE A SMALL SAMPLE OF THE MANY COMPELLING SITES STUDENTS CREATED DURING 2016. Ashley Brown "Being African American and Pre-med"
Landon Porter, Allie Hopper, Madison Prieto, Samuel Keys "Colin Kaepernick: A Story Distorted by the Media"
MANY WRD STUDENTS ARE ALSO ENCOURAGED TO DESIGN PODCASTS IN SOME WRD COURSES. THE PROJECTS BELOW REPRESENT MANY OF THE THOUGHTFUL AUDIO PROJECTS CREATED IN WRD CLASSES IN 2016. Melissa Williams "The Culture of the Martin Luther King Center"
MANY WRD STUDENTS USE VISUAL AND GRAPHIC DESIGN COMPONENTS IN PROJECTS. BELOW IS A SAMPLE OF SUCH VISUAL RHETORIC COMING OUT OF WRD CLASSES IN 2016. Adam Blevins and Alivia Houser “Is It Worth It?"